Hailing frequencies Broad range of (subspace) communication frequencies which serves to contact alien ships, in order to ensure that the message is received. Hailing messages are usually sent in various languages when an unknown alien ship is encountered (generic). Hangar deck 23rd century designation for a shuttlebay (TOS). Harmonic resonance chamber Containment module for the highly unstable Omega Molecule. 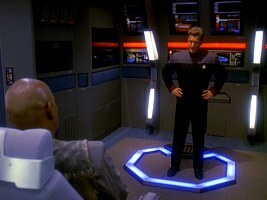 Seven of Nine designed such a chamber based on previous Borg experience with the molecule (VOY: "The Omega Directive"). Just before Seven reluctantly destroyed the molecules on Janeway's orders, they began to stabilize. The concept of a chamber that allows only certain wave modes to stabilize and shape matter is not as fundamentally flawed as the idea that chemical reactions involving the Omega Molecule could be more powerful than even matter/antimatter annihilation. 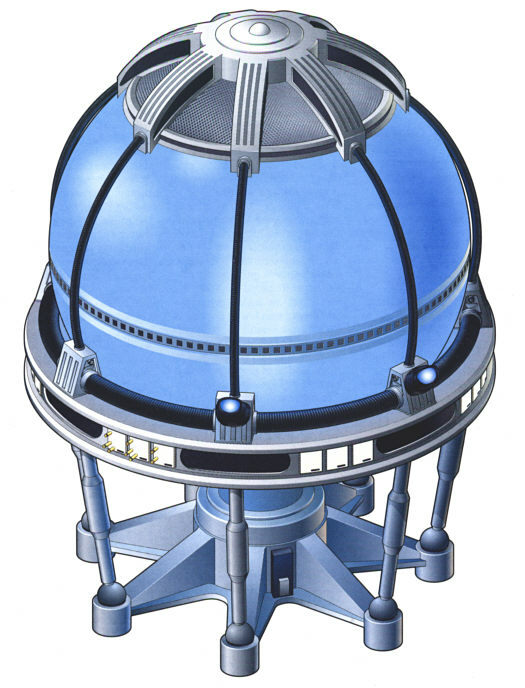 Harvester Type of biogenic weapon used in the war between the T'Lani and the Kellerun (DS9: "Armageddon Game"). 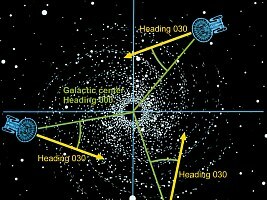 Heading Course vector that is specified relative to the center of the galaxy. A heading consists of the two coordinates azimuth (horizontal angle) and elevation (vertical angle). Heading 000-mark-0 represents a direction towards the galactic center, regardless of the absolute position in the galaxy. 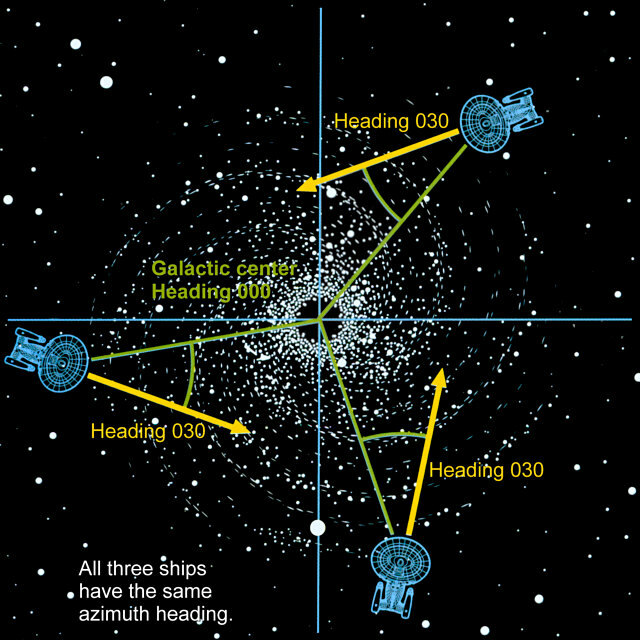 Unlike the bearing, which is used to specify the relative position of another starship or celestial object, the heading may indicate the ship's course (generic). Heisenberg compensator Part of the transporter system that is connected to the molecular imaging scanners and balances out the Heisenberg effect. This effect is a quantum uncertainty that would otherwise not allow to exactly reconstruct the state of a complex electronic device or an organism, in particular a neural system (TNG: "Realm of Fear", "Ship in a Bottle"). Hodgkin's Law of Parallel Planetary Development Theory that, under similar environmental conditions, planets would develop similar lifeforms and eventually similar forms of civilizations (TOS: "Bread and Circuses", ENT: "Strange New World"). Already in his first draft of Star Trek (PDF) Gene Roddenberry praised the cost-saving idea of "parallel Earths" that would allow to re-use sets of other TV series. Hodgkin's law was apparently conceived to justify why so many TOS planets looked exactly like Earth, and its inhabitants like humans. Additionally, the concept of the Preservers (TOS: "The Paradise Syndrome"), of other powerful alien races and ultimately of the common ancestry of all humanoids of the Milky Way Galaxy (TNG: "The Chase") helped rationalize the lacking diversity of alien life in the Star Trek Universe. In ENT: "Strange New World" we can see a book called Handbook of Exobiology that illustrates Hodgkin's finding with the termites of Loracus Prime that are remarkably similar to those on Earth. Interestingly, there is a real-world analogy to Hodgkin's theory, the principle of convergent evolution. Read more about this topic in Other Exobiology Inconsistencies. Holographic communicator in DS9: "For the Uniform"
Holo-communicator Holographic communication device that was installed on some Federation ships and stations in 2373, but was soon abandoned (DS9: "For the Uniform", "Doctor Bashir, I Presume"). We saw the holo-communicator in just two DS9 episodes, but in no less than three places (Defiant, Malinche, Deep Space 9). We have to wonder why the device that was obviously developed beyond prototype status and installed on at least two ships and the station was abandoned after what seems like just one week in service. Considering that the normal viewscreens are supposedly holographic anyway (only that it is not possible to walk around them), the holo-communicator was not such a big progress anyway. In the Star Trek Discovery reboot, holographic communicators are commonplace as soon as in 2256 (DIS: "The Vulcan Hello"). Holodeck Area aboard a starship or any other facility equipped with a 360-degree projection and forcefield system to recreate or simulate whatever natural or artificial environment is requested. 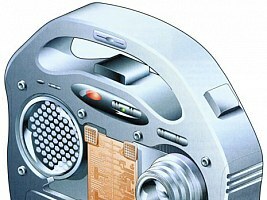 The projection system is based on the omnidirectional holodiode. Numerous holodiodes are arranged in form of an array in the walls of a holodeck. Mere holographic light projections are employed to recreate remote scenery, while objects likely to be touched may be replicated. The projection always includes the whole three-dimensional structure of the environment, of which the visitor only perceives a two-dimensional cross-section, according to his current visual angle. 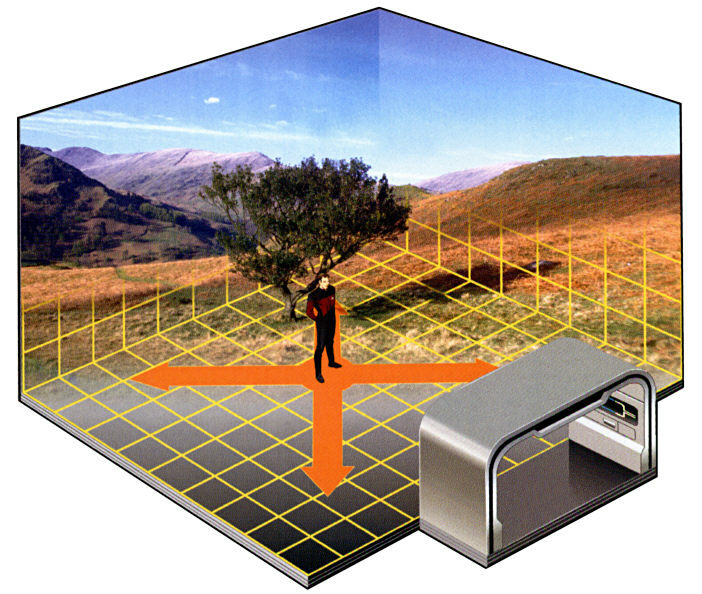 In order to simulate a much larger environment than the size of the holodeck, forcefields are moving beneath the feet of the participants while the whole environment is scrolling (treadmill effect). Holodecks are customary on Federation starships since the 2360s (generic). 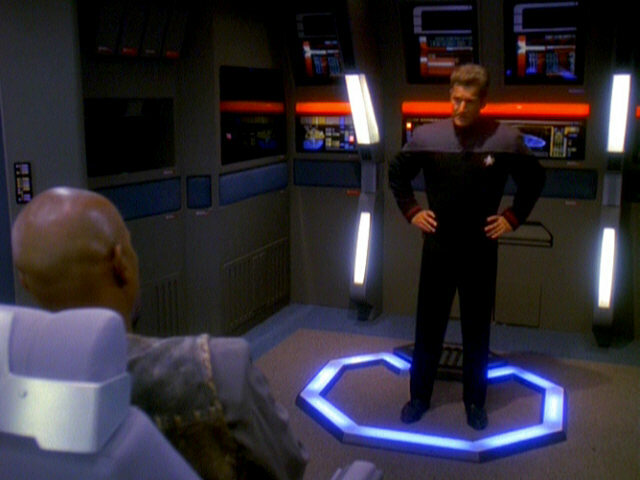 It has been shown in several TNG episodes and mentioned in the TNG Technical Manual that the holodeck does not only project light or forcefields, but is also capable of actually creating matter. It is obvious that the holodeck includes replicators to generate permanent matter. Only this way it can be rationalized why Wesley remains wet after leaving the holodeck in TNG: "Encounter at Farpoint" and why the piece of paper with the Enterprise schematic drawn by Moriarty continues to exist outside the holodeck in TNG: "Elementary, Dear Data". Still, there is also the so-called "holomatter". It is equivalent to real matter, as long as it remains on the holodeck. The properties of holomatter (namely Moriarty) and the possibility to convert it to real matter with the help of the transporter are discussed in TNG: "Ship in a Bottle". The holomatter characters in TNG: "The Big Goodbye" do actually vanish just outside the range of the holoprojectors. However, according to the TNGTM this matter does not cease to exist outside the holodeck, but is only without computer control. Maybe the holodeck has been improved in the meantime so as to provide "real" characters. 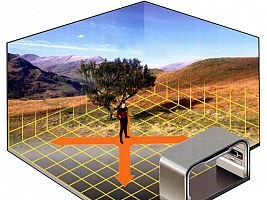 The treadmill effect to move within the simulation is plausible as long as only a few persons are present, and the holodeck might be split if the two persons or two groups of persons move too far away from one another in the simulation. The holographic projection system is fascinating, yet mysterious. 20th century holograms reproduce a surface which can be viewed from any angle up to 360 degree. Star Trek holodiodes actually create a volume by suited interference of electromagnetic beams, and a person is able to move within this projection without disturbing it. More about holodecks here. In the Star Trek Discovery reboot, a holodeck with much the same capabilities as in the TNG era exists as soon as in 2257 (DIS: "Lethe"). Holodeck safety protocol Subroutine that prevents a holographic projection system from producing harmful objects, substances, radiation or situations which may cause a user's injury or even death (TNG, DS9, VOY). Hologram Three-dimensional light projection, especially one created in a holodeck (generic). 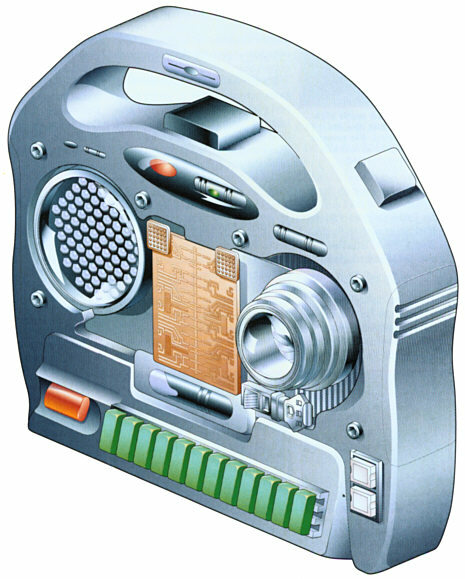 Holo-imager Camera designed to capture holographic images (DS9: "Meridian", "Image in the Sand", VOY: "Latent Image", "In the Flesh", "Life Line"). Holosuite Fundamentally the same installation as a holodeck, however, supplemented with some special programs that probably do not exist on Starfleet ships. ;-) Holosuites can be found in Quark's bar on Deep Space 9 (DS9). Hopper Small craft designed for atmospheric flight. Hoppers may be used to transport personnel if beaming is not possible (DS9: "Nor the Battle to the Strong"). Hovercar Generic name for any vehicle that is capable of hovering above the ground, a common means of planetary transportation from at least the 22nd to the 24th century (VOY: "The 37's", DS9: "Image in the Sand"). Well, Harry Kim should at least know that a hovercar doesn't need the wheels that a 1936 Ford truck obviously has... Anyway, we have seen many unidentified hovering vehicles beginning in the 22nd century (ENT: "Shockwave"). Sarah Sisko died in a hovercar accident. Hull breach Generally, any damage of the outer hull of a starship that exposes its interior to open space, leading to rapid decompression. At latest since the late 23rd century hull breaches are automatically sealed off in a matter of a few seconds, using forcefields (generic). Hull plating Basically, any form of plates that cover a starship hull. Specifically, polarized hull plates served as a protection against weapons before shields became available (ENT). See also ablative hull armor and "armor". Hunter probe Small remote-controlled device that may be used as a weapon (DS9: "The Darkness and the Light"). Silaran Prin used hunter probes in different fashions in his revenge on members of the Shakaar resistance cell. Hyperacceleration Process in which an individual experiences a much faster time lapse than others. The Scalosians are a whole race that, due to the environmental conditions on their planet, became permanently hyperaccelerated (TOS: "Wink of an Eye"). While it was impressively portrayed in the TOS episode, hyperacceleration is not a viable concept - neither biologically nor physically. It would either require a miraculous physiology of the accelerated individuals to be able to move at miraculous speeds, vertainly nothing that a species could accomplish by evolution while still remaining humanoid. Alternatively, although it was said to be a natural effect in the episode, it may involve some sort of time-shielding field. Drinking a cup of drugged coffee, like Kirk did it, can naturally not have either of these two effects. Hyperencephalogram 23rd century medical diagnosis of recording brain wave patterns. The output is a brain-circuitry pattern (BCP) (TOS: "The Lights of Zetar"). The name insinuates that this is a further development of a 20th century EEG. Hyperspace Concept of an additional spatial dimension, useful to describe a folded 3-dimensional space (TNG: "Coming of Age", "Conspiracy"). The term hyperspace occurs extremely seldom in Star Trek, in contrast to most other science fiction. It is possible that during early TNG the writers were just confused and actually meant to say "subspace". However, assuming that hyperspace is something different and is the same "shortcut through space" as in the real-world theory of wormholes, hyperspace may well serve to explain why Star Trek wormholes allow faster traveling than any warp drive. 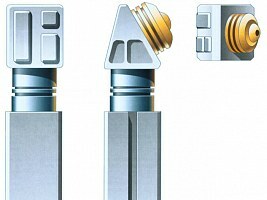 Hyperspanner General purpose engineering tool utilized in Starfleet (DS9: "The Ship", "Empok Nor", ENT: "Singularity"). 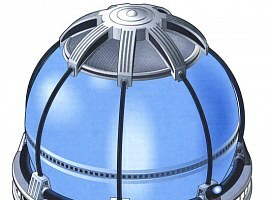 Hyperthermic charge Type of explosive weapon used by the Vidiians (VOY: "Deadlock"). 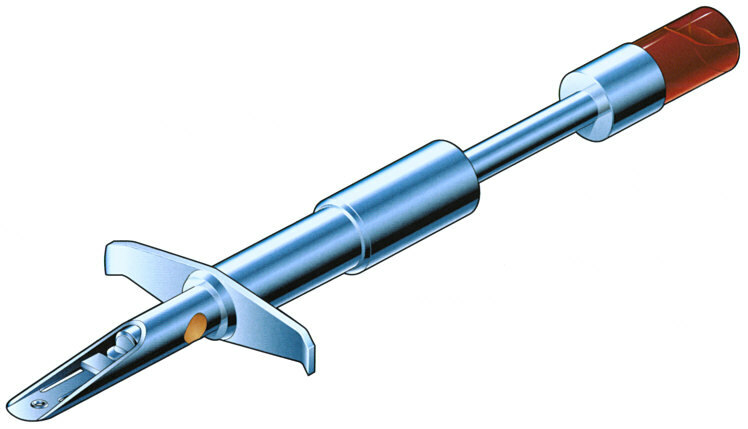 Hypospray Medical device that permits subcutaneous or intravenous injections without a syringe. The hypospray evaporates the medicament and ejects it under high pressure in order to penetrate the epidermis without damage (generic). 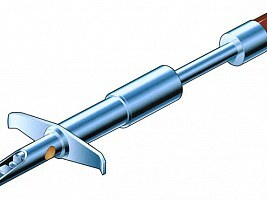 Hyposprays exist already in our time, although they have not come into widespread use, maybe because of the incapability of bringing exact doses into the blood stream. 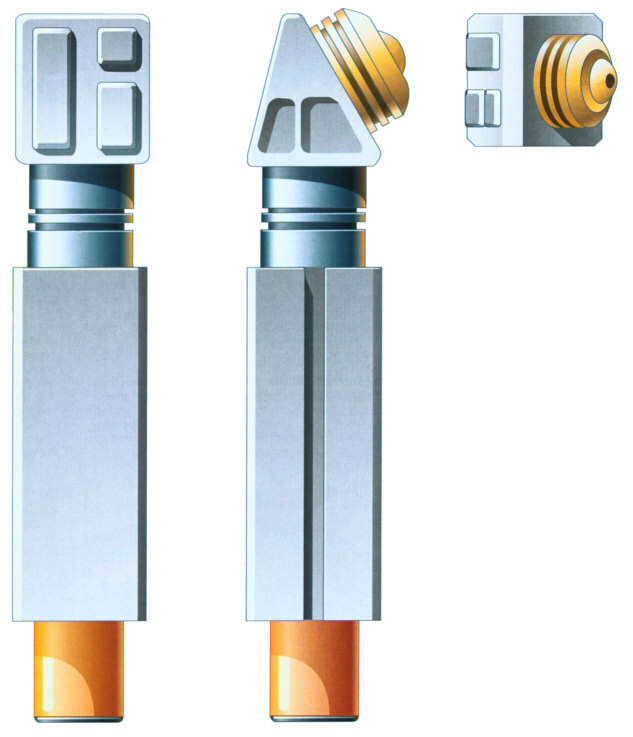 Invented in the 1940s and nowadays marketed as "jet injectors", hyposprays are used to deliver small volume doses of high potency medications through the skin, such as insulin or vaccinations (thanks to Dr. Seth Cohen for pointing me to the jet injectors).